ecocity | publicity | mobility: Green Highways? Ok, I have to admit, I'm pretty bored at this stage hearing the same thing over and over again about how hydrogen and electric cars are going to change our lives forever. It's not that I'm skeptical, because I'm not, but move on people, these technologies need to be mainstreamed. In the meantime we have to fill the gap. How do we make our existing highways into green highways? Well the first thing is turn off those excessive motorway lights, not pointing any fingers or anything...ugh....Belgium. Another European country, Finland is proposing the world's first carbon neutral highway connecting Turku in the west through Helsinki to the Russian border in the east. The 81 mile stretch of road is dedicated to electric vehicles. The service stations along the motorway, pictured below, not only provide solar electricity but also locally sourced biofuels. And back to the lighting issue, the motorway will be lit by smart lighting that switches off at entry points where no cars are present. Also the lights will adjust to compensate for the weather conditions. Add to this LED street lights which are up to 60% more efficient than traditional roadway lighting, last for 12 years and allow for cost recovery through energy savings in just three years. solar electric car charging station along the green highway. “The aim is to create the model for an ecological highway that could be used even on an international level,” said Aki Marjasvaara with the Loviisa municipality spearheading the project. “No other such project exists. This would set an example to the world,” he told AFP. Car sharing services such as Zipcar and car pooling services such as Zimride have been making strides in gaining a critical mass, the later helped by the fact that is it funded by Facebook and runs it's offices out of the building next door in Paolo Alto. But what is the next big innovation? Over this side of the pond, the European Union's Safe Road Trains for the environment has been progressing nicely, according to Wired's Autopia. 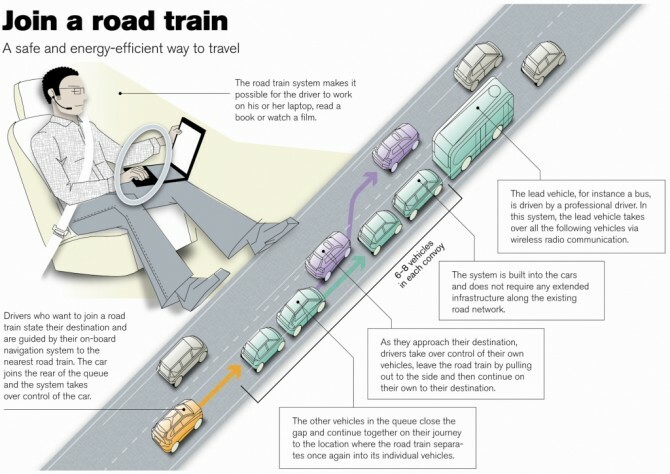 In a road train, a platoon of cars are electronically tethered to follow closely behind a professionally driven lead vehicle — most likely a bus. While the cars can drive themselves on highways, this Sartre does have an exit and drivers can take over the wheel whenever it’s time to head to an individual destination. With the system, Sartre engineers hope to increase aerodynamic efficiency and reduce congestion with no changes in infrastructure, while giving drivers all the benefits of carpooling with the privacy of an individual car. After a year of concept development and simulation work, which can be seen in the video below, Sartre plans to have a real-world test with a single following car by the end of 2010. The prospect of keeping our eyes on our iPads while our cars drive themselves in formation behind a lead vehicle seemed intriguing, so we were glad to hear that the tests seemed to be going well. Development will continue until 2012, with a five-car road train as a final project goal.